Flash floods are incidences of rapid flooding in which low-lying parts of an area are completely submerged. In many instances, a flash flood occurs as the result of some type of natural phenomena like heavy rains, hurricanes, or some type of tropical storm. However, a flash flood may also occur due to the collapse of a natural or man-made dam. With flash flooding, there is usually very little warning I advance that the given area will flood, making it very difficult for people living in the affected area to plan mitigation in advance. When flash flood takes place, the process often begins with the ground becoming so saturated with rainfall that it is unable to absorb all the water that has fallen in a short period of time. Since water runs downhill, it tends to collect in low-lying areas. With further heavy rains, the water levels rise, eventually covering the area completely. Often, the flowing water has a tremendous ability to not only damage but to completely destroy anything in the path of the water flow. Entire towns have been destroyed due to the collapse of a dam, leaving little behind but building foundations and the accumulated rubble from upstream sources. Get to higher ground as quickly as possible. Leave places likely to flood (e.g., canyons, ditches, dry stream beds) as quickly as possible. Do not try to cross flood water. Move furniture and valuables to higher floors in home. Fill bathtubs, sinks and plastic bottles with clean water. If told to evacuate, do so as soon as possible. Keep important documents, insurance policies and other valuables in a safe deposit box. Throw out any food that has come in contact with flood waters. Boil drinking water before use. Have the water tested for purity before drinking. If unsure about the water, call the public health authority. Do not visit disaster areas unless you are there to help. Make sure that electrical equipment is dried before restarting service. In the month of August 2010, at least 193 people were killed and more than 500 were injured when flash floods triggered by torrential rains struck Leh in Ladakh region, northeast of Jammu and Kashmir, leaving a trail of death and destruction. 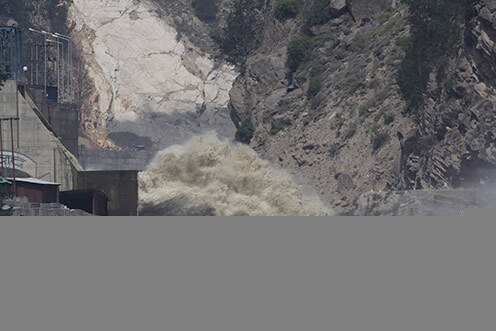 A series of cloudbursts in this Himalayan pocket prompted these floods. Leh has no history of flash floods in the past. The city usually receives very little rainfall. August is the peak tourist season when thousands of western backpackers flock the area. This lead to heavy damage to the tourists as well. Many buildings were destroyed including Hospitals, bus terminals, radio station transmitter, telephone exchange and mobile-phone towers, even the BSNL communication systems were fully destroyed, the communication was then restored by the Indian Army. The local bus station was damaged and some of the buses were carried more than a mile by the mud. The city's airport was damaged but this was repaired and relief flights were expected to come in the following day. The village of Choglamsar on the outskirts of the city was particularly badly hit. All of the estimated 3000 tourists in the area including 1000 foreigners were safe, according to local officials. The rescue efforts were hampered by gushing water and mud which was 10 feet high in places. In addition many of the roads leading to Leh were damaged making it difficult to truck relief supplies in. Four hundred critically wounded people were evacuated and some were admitted to army hospital in Leh. 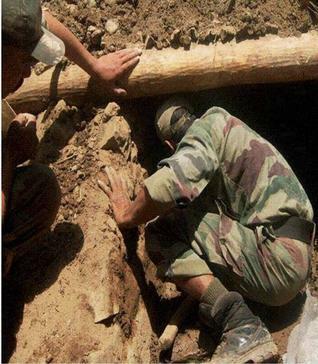 Indian Army soldiers launched a massive rescue operation. According to the Indian government, over 6000 security personnel were deployed in Leh for rescue operations. The Prime minister announced compensation of Rs. 100,000 to the kin of deceased and Rs. 50,000 for those injured.